Full focus from Matt – donate to KALW on Giving Tuesday. 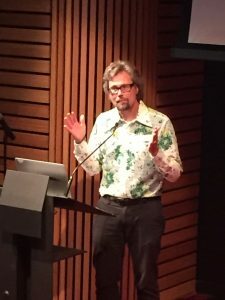 After a respectful evening of praise for being a “guiding light” at KALW for 17 years, Matt Martin, ex-General Manager of the public radio station, asked everyone to “Help Us Continue Matt’s Work” by donating to the radio station today on Giving Tuesday. To donate, text VOICES to 44-321. That would be a typical Matt response. 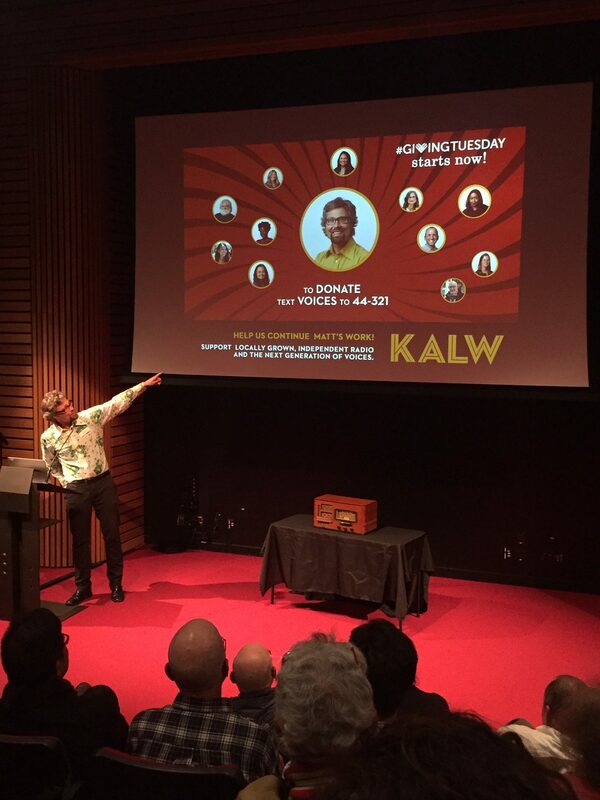 Driven by imagination to look at KALW and its community to see how it can be better. I met Matt around six years ago when he proposed that ACE support educational programs via an ACE Learning Center at the radio station. Both organizations (KALW and ACE) use Federal Communications Commission (FCC) assigned Educational Broadband Spectrum, so we had something in common. ACE started supporting Burton High School students learn about radio journalism, but then Matt’s imagination took over. He pitched Audio Academy, a nine-month program of teaching and mentoring students in the future of community journalism. I don’t think even Matt knew what a great success it would be. Audio Academy is the only radio station-based classroom for community radio journalism. It has provided KLAW a national profile unknown for a small public radio station. National Public Radio was so impressed with the program that it asked for the teaching syllabus. Not sure if Matt ever gave it to them, but Audio Academy has not been recreated anywhere else. It takes more than a syllabus to be successful, and Matt drove for excellence in teaching with a mentor strategy. Every Audio Academy Fellow is assigned a Crosscurrents news room Mentor who works one-on-one with each student. Learning, with all its mistakes and opportunities, becomes personal. Driven. From the heart and soul. Complete the program giving the very best on both student and mentor sides. The result: leadership careers have been made in the public radio and communications community. Graduates have secured jobs at national and international radio stations. Alumni have created radio programs and podcasts that have grown to national syndicated status. They’ve taken the KALW skills of telling a story in audio form to a higher level. One graduate used audio to enhance a story of immigrants crossing the sea to Greece which was rewarded with an Academy Award nomination. The background sounds of the boat, water and human destress added to the drama. Audio Academy graduates have even earned jobs at KALW in the News Department, continuing the high level of audio story telling as editors, producers, announcers and reporters diving deep into the Bay Area’s diverse and complex community. It’s about imagination says Matt Martin. And donating to KALW on Giving Tuesday. Matt responded in his usual low key, humble style. 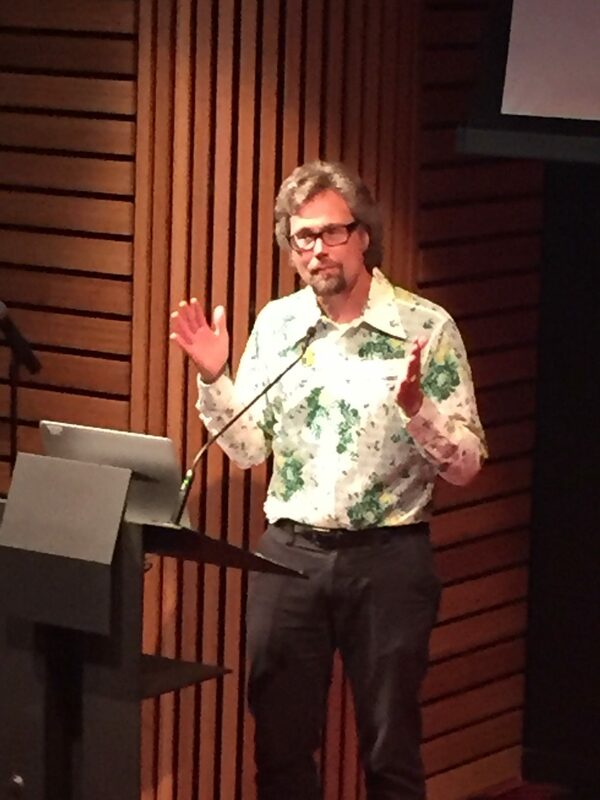 He talked about his belief in the “creative power of community” and in imagination as a driving force for good. “With imagination, you see something clearly in your mind, then take steps to create it,” he said. The stand-up round of applause was appropriate, requiring Matt to take an encore return to the stage because the crowd wouldn’t quit clapping. But even at the very end, he didn’t give up. All KALW and Audio Academy supporters – let’s do it.